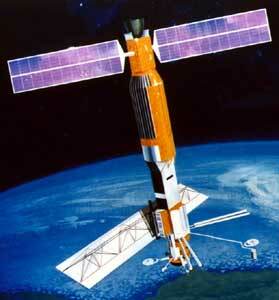 Seasat was the second satellite carrying a synthetic aperture radar (SAR). It was the first designed for remote sensing of the Earth's oceans. The mission was designed to demonstrate the feasibility of global satellite monitoring of oceanographic phenomena and to help determine the requirements for an operational ocean remote sensing satellite system. Specific objectives were to collect data on sea-surface winds, sea-surface temperatures, wave heights, internal waves, atmospheric water, sea ice features and ocean topography. The mission ended on 10 October 1978 due to a failure of the vehicle's electric power system. Although only approximately 42 hours of real time data was received, the mission demonstrated the feasiblity of using microwave sensors to monitor ocean conditions, and laid the groundwork for future SAR missions. The major difference between Seasat-A and previous Earth observation satellites was the use of active and passive microwave sensors to achieve an all-weather capability. On 10 October 1978, the satellite suffered a massive short circuit in its electrical system and stopped functioning. SAR (Synthetic Aperture Radar) - L-band, 1.275 GHz, 100 km swath, 25 meter vertical resolution. ALT (Radar Altimeter) - Ku-band, 10 cm vertical accuracy. SASS (Seasat-A Satellite Scatterometer) - L-band (1.275 GHz), wind speed accuracies of +/- 2 m/s and 20° (direction). SMMR (Scanning Multichannel Microwave Radiometer) - The experiment was passive, and operated at 6.6, 18, 37, 10.7 and 21 GHz (600 km swath width).